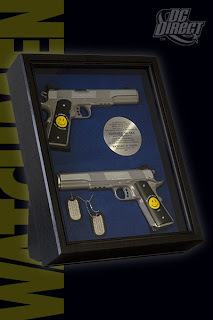 This prop replica set features The Comedian's trademark sidearms (with the commemorative handle grips presented by President Nixon), a plaque recognizing The Comedian's service to his country, and his military-issue dog tags. All of the components are permanently mounted inside an acrylic-covered frame, which can be hung on a wall or set on a desktop. 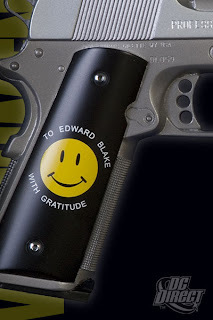 This prop replica of The Comedian's guns are cast from the actual props used in the movie! 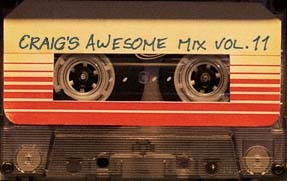 ged in a 4-color box.